Nobel peace prize winner and Pakistani Muslim Malala Yousafazi has hit out at Donald Trump’s plan to ban followers of her religion from coming to America. Malala, 18, who was shot in the head on a school bus by Taliban fighters after advocating education for Muslim women, called the Republican frontrunner’s comments ‘tragic’ and ‘full of hatred’. Speaking at an event to remember 141 people killed during a terror attack on a school in Peshawar last year, she said it would be ‘unfair’ to ban all Muslims because of the actions of a few terrorists. Asked about Trump, She said: ‘Well, that’s really tragic that you hear these comments which are full of hatred, full of this ideology of being discriminative towards others. ‘It will be very unfair, very unjust that we associate 1.6 billion with a few terrorist organisations,’ she added, quoting the number of people who follow Islam worldwide. 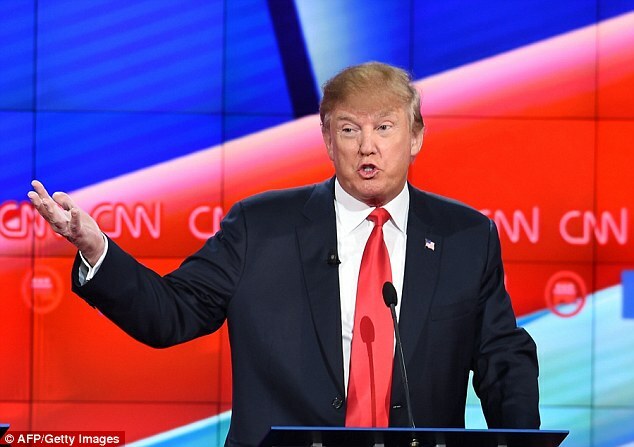 Trump has been criticized by politicians of all stripes after calling for a complete ban on all Muslims coming to America in the wake of the San Bernardino terror attack. Syed Farook, and American-born Muslim, and his wife Tashfeen Malik, a Pakistani who lived in Saudi Arabia before coming to the U.S. in 2014, killed 14 people after becoming radicalized. Reaction came from across the political spectrum in the wake of his comments, from Democratic frontrunner Hillary Clinton to GOP House Speaker Paul Ryan. At last night’s Republican debate in Las Vegas, Jeb Bush joined those attacks by saying the policy was ‘not serious’ and accusing Trump of being a ‘chaos candidate’. Trump has been lambasted in Britain after claiming in subsequent interviews that parts of London are so radicalized that police fear to go there. In an unusual intervention into American politics, British Prime Minister David Cameron called Trump’s comments ‘divisive, unhelpful and quite simply wrong’. A petition on the UK Government’s website calling for Trump to be banned from the UK has subsequently topped 500,000 signatures, making it the most popular ever. After being shot in her native Pakistan, Malala was taken by plane to the UK where she was treated and started a new life, before taking up her education campaign once more despite terrorist threats. 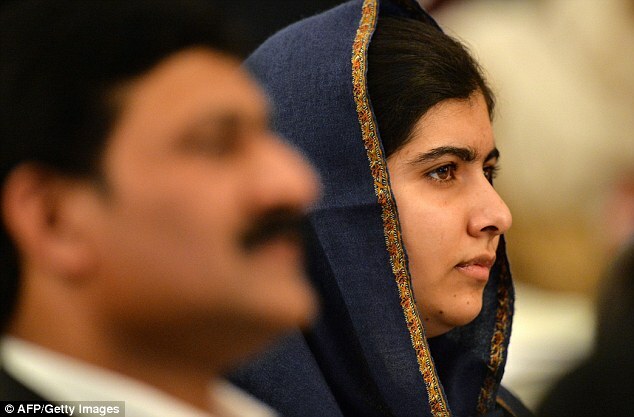 In recognition for her achievements, she was awarded the Nobel Peace Prize last year aged just 17. Malala made her comments from a conference hall in Birmingham, Britain’s second largest city, last night alongside two survivors of the Peshawar massacre. She added: ‘There are these terrorist attacks happening, for example what happened in Paris or what happened in Peshawar a year ago. 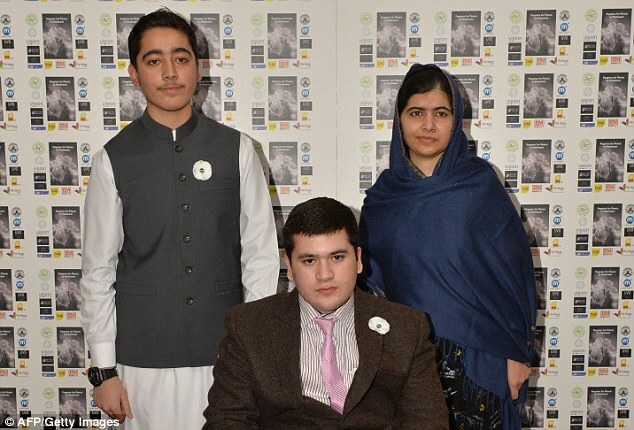 Ahmad Nawaz, 14, and Mohammed Ibrahim, 13, joined her on stage during her speech. Speaking about his experiences afterwards, Nawaz said: ‘I saw my teacher burned alive in that incident, and the friends with whom I was playing. While Nawaz escaped after being shot in the arm, his brother was killed by the Taliban attackers. Meanwhile Ibrahim now has to use a wheelchair, having been paralyzed from the waist down. National security and America’s response to terrorism has come to dominate the current electoral cycle where the economy and job creation had once been the largest issue. 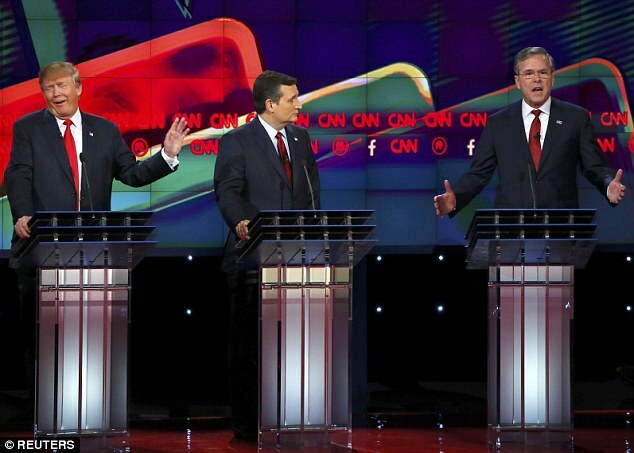 All the Republican candidates at last night’s debate were keen to tout their anti-terror credentials, while also presenting themselves as tough enough to keep the U.S. safe. While Marco Rubio and Ted Cruz got into a row over NSA surveillance of people’s phone records – and whether it goes far enough to allow security services to pick up on potential terror threats – while Chris Christie touted his previous experience in the field. He said that, in the years after 9/11, New Jersey had been under constant threat of attack from terrorists and he had to make decisions over whether or not to act on intelligence passed to him. 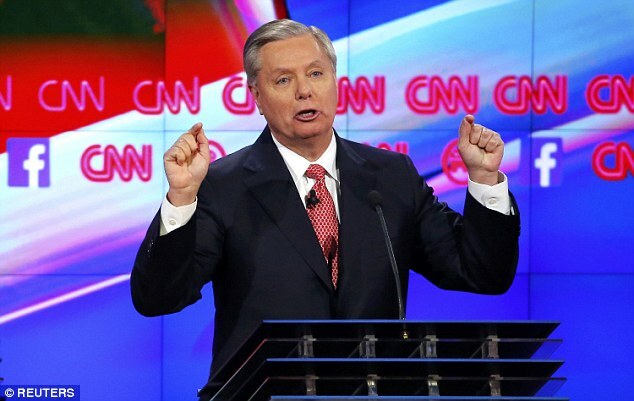 Lindsey Graham who, like Christie, had previously been relegated to the lower tier debate, found himself back at the big-boy’s table and sought to cement his position there with tough rhetoric. Delivering yet more tough talk on ISIS, Trump seemed to be advocating either mass surveillance of the internet or mass censorship in order to combat the threat of ISIS propaganda. He said: ‘ISIS is using the Internet better than we are using the Internet, and it was our idea. ‘What I wanted to do is I wanted to get our brilliant people from Silicon Valley and other places and figure out a way that ISIS cannot do what they’re doing.